and life gets no sweeter than in sunny Italy. Fabulous food and wines…dreamy landscapes… history, culture…passionate people… lavish hospitality…time-honored traditions. A land where pleasures can be as profound as the works of Dante…or as frothy as a cappuccino. Italy has a staggering amount to offer. Romantic cities. Timeless hill towns. Snowy mountains, idyllic islands, and a rivetingly beautiful coastline. A number of years ago, a reader sent me an e-mail. He and his wife were thinking of relocating to Italy… and wondered if I would please send details about some of my favorite places in that country. Where should they start exploring? To be frank, I didn't know how to respond. I've been visiting Italy for more than 25 years…and after every trip, I realize I've found more places to fall in love with. Italy is one of Europe's most magical and vibrant countries. The watery beauty of Venice. The bedazzlement of Florence. The Eternal City itself, Rome. Most travelers have a favorite Italian city, but not me. I adore them all. Let me give you a flavor of just one of these enchanted towns. 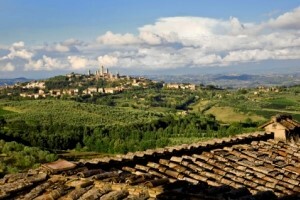 A while back, I spent some idyllic days in a little rented cottage on a wine-growing estate near San Gimignano. The countryside hereabouts is completely unspoiled—a golden land of vineyards, olive groves, and sunflowers… gentle wooded hills crowned with castles and medieval villages. Walking back from the town one night, the road home was lit up by the twinkly lights of what must have been thousands of glow worms. A place where the clocks seem to have stopped a couple of centuries ago, San Gimignano is incredibly lovely… a background image from a faded Renaissance masterpiece. Even if you're not on the property trail, it's worth crossing the ocean just to absorb the atmosphere. My visit coincided with its main summer festival… and Italy's calendar is studded with all kinds of colorful festivities and saint's days. Everybody—even kiddies—seemed to be gadding about in medieval costumes. "A place where the clocks seem to have stopped a couple of centuries ago, San Gimignano is incredibly lovely… a background image from a faded Renaissance masterpiece". …then I can tell you exactly where you can pick up the keys to some incredible deals. A pretty semi-detached stone house for sale. The property is on two levels, with two-bedrooms, 646 square feet of living space, and great views. Price: €55,000 ($59,000). Italy isn't only a lifestyle choice, of course. According to the World Tourism Organization, with over 43 million annual visitors it's the world's fifth most visited country. For investors, that means a steady demand for short-term rental accommodations. These are uncertain financial times, admittedly. But if you're thinking of the tourist market, buying the right property in a country so steeped in culture, history and sensuous pleasures comes with few risks. Not in my view. Honestly, can you imagine that the tourist stream is likely to dry up any time soon? Of course it's not. Italy has been right near the top of the world's vacation wish list ever since the aristocratic Grand Tour got underway in the 18th century. Unlike in parts of 'the New Europe', Italian ski and seaside resorts aren't two-season-wonder locations. In Italy they have a long-standing property track record. Yes, rentals are seasonal, and outside the cities and ski resorts, few tourists are around in winter. However, many seaside resort and countryside properties attract the same families back summer after summer. Although property values in Italy are cooling—and it's a buyers' market—they're certainly not heading toward permafrost territory. Obviously even Italy isn't immune from the downturn sweeping the world. To give you the full picture, some cities have experienced quite large falls. Naples is down around 19%, but it was way over-priced to start with. But looking at the figures from a nationwide perspective, the dip in overall housing values is a mere fraction compared to the plunge in some other major European countries. In part, this is because Italian banks had more conservative lending practices than banks in the US or UK. Unlike their counterparts, they only offered mortgages of up to 70%. There is no huge cache of repossessed homes flooding the market. Also, the Italian housing boom of the last decade didn't trigger the same massive increase in new builds that happened in countries such as Spain. Even during the boom, price rises were relatively sensible across most parts of the country. But to be candid, it's hard to see how many countryside and village properties can get much cheaper than they already are. My suspicions are that if they're not snapped up soon, some owners will pull them off the market and wait for the economic tide to turn. Steenie Harvey here, I'm International Living's Roving Euro Editor—and I've been roving around Italy for over 25 years. …and sleeping beauty properties at exceptionally alluring prices. "I took a scouting trip to an overlooked part of Central Italy. Crisp blue skies, dreamy hill towns, the diamond-bright peaks of the Apennines… and sleeping beauty properties at exceptionally alluring prices". In one medieval hill village, I viewed a two-bedroom apartment in the historic center of the village. Fully removated it has 1,076 square feet of living space, a nice terrace, and a shared garden. That equates to around $112,800 in dollar terms. A house located in a nice village with stunning views, a 30-minute drive from the sea. The house consists of a kitchen, a living room with fireplace and balcony, two bedrooms, and a bathroom with a shower. The house is situated near the center of the village and is in good condition and well restored. Price: €38,000 ($40,800). A 667-square-foot, one-bedroom, one-bathroom apartment. It has a kitchen, living room, and a nice view over the countryside. It's located less than a mile from the sea. Price: €58,000 ($62,300). A nicely-finished, detached house with two-bedrooms over 807 square feet of living space. It has a nice-sized garden at the rear. It's described as being in excellent condition. Price: €89,000 ($95,600). Maybe you're wondering why homes in this corner of one of the world's most beautiful countries—homes that are less than a couple of hours drive from Rome—are so affordable? Simple. Because it's one of those unsung parts of Italy that few foreigners have heard of. Guidebooks devote only a couple of pages to this region—if they mention it at all. But that's good news for you. You see, this lovely region of olive-dappled countryside is seriously undervalued. Although it's as scenically gorgeous as Tuscany and Umbria, comparable real estate is often up to 70% cheaper. Come visit and you'll be baffled as to why it has been ignored for so long. Its palazzos might be faded, its watchtowers crumbling—but its unsung hill towns are as photogenically stunning as those in high-priced Tuscany. Dotted with vineyards and small farms, this is the old Italy where rustic charm has survived the centuries intact. But word is getting out. The budget airline comes in… European holiday-makers fall in love with astoundingly cheap properties… prices rise. Ryanair is now serving this central Italian region. And the airport is only a 30-minute drive away from some really choice hill villages—including the one where I viewed the $75,000 property. The beaches are even closer—20 minutes. If you didn't want to live here full-time, these village homes would make for a great vacation rental. Pulling in $500 a week in summer should be easy. Most towns and villages are within an hour's drive of the Adriatic. So in late spring, the sea and mountain combination means you could be skiing in the morning and beach-bumming in the afternoon. The sands here are smooth and golden—and even in winter, the waves sing of summer's promise. It's a whispered lullaby of sizzling sunshine and balmy evenings, of fishing trips and harbors jostling with white-sailed yachts. Piazzas erupt with parties. Lengthy meals are enjoyed al fresco. And did I say that from almost every little settlement, views are sensational? You can always see another collection of spires, towers, and rooftops lying like buried treasure in the folds of the mountain foothills. Whether it's fresh fish, hearty bean soups, rosemary-scented lamb, home-made maccheroni alla chitarra (pasta rolled through a stringed board and cut thin as guitar strings), or pizza sprinkled with black truffle shavings, the food is to die for. It certainly doesn't cost a lot to enjoy the pleasures of the table here. You can have a 2-course lunch with what one friend calls 'an adult beverage' for $12. Or choose from a fabulous range of wood-oven pizzas for under $7.40. Large carafes of wine for $5.40 are the norm, not the exception. For many people, where to find the world's most passionately indulgent lifestyle is no secret. At the last official count, 4,387,721 foreigners were living in Italy. Living there and enjoying la dolce vita. That's local lingo for 'the sweet life'. And I can promise you life is sweeter than honey. Whether you choose to live near the Mediterranean, the Adriatic or the Alps, Italy offers the kind of life that can't be duplicated anywhere else on the planet. No argument. Even some of its better-known beauty spots might not necessarily be beyond your budget. Take Lake Como where snow-capped peaks are mirrored in serene, sapphire waters. This is where Hollywood actor George Clooney comes to seek peace and privacy for three or four months each year. He has bought Villa Oleandra, in Laglio village on Lake Como's shores. Crowned with ancient churches, all the villages girdling the lake are storybook affairs. Cobbled streets clamber up towards the forested hills; sparkling waterfalls descend into little rivers spanned by arched stone bridges. "This is where George Clooney comes to seek peace and privacy for three or four months each year". Draped in wisteria, lakeside village houses are often painted in warm summer shades of daffodil yellow, peach, pink, cream and butterscotch. Perfumed gardens brim with statuary and all kinds of tropical flowers. $171,500 for a property in this corner of heaven sounds pretty reasonable to me. Yes, just $171,500 for a lake view apartment on Lake Como's shores. It has one bedroom, one bathroom, and has been fully restored. It's through one of the recommended real estate contacts you'll find in Escape to Italy (more about this in a moment). No guarantees you'll run into Gorgeous George, but the UK Times reported that on his arrival he wrote to his neighbors apologizing for any "inconvenience" his presence caused them. He said "My greatest desire is just to live in this wonderful village and walk along its lovely streets." I want to share a letter from Bill V, an International Living subscriber from San Diego. "Steenie, I just closed on a fabulous condo in Agropoli, a 1,000 square foot condo for US $175,000. 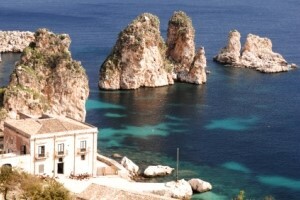 It's right on the coast near Paestum, 15 minutes drive south of the Amalfi coast. It sits about 1,000 feet above the city with spectacular views of the coast, harbor, beaches, and mountains. The airport near Salerno now has direct flights to and from Milan, Mykynos, Ibiza, and other Mediterranean destinations. Plus an 18 hole golf course is being built near town. It's great to be near the Amalfi coast and Capri… venturing over whenever I want to." By taking my advice and shopping for a property in ‘hidden Italy' instead of the really well-known tourist hotspots, Bill has saved himself thousands of dollars. That's no exaggeration. A similar-sized property along the Amalfi coast itself will easily run you over $500,000—and cost over $1 million on the Isle of Capri. Yet Bill is enjoying exactly the same coastal splendor for a lot, lot less. In Escape to Italy, I'll introduce you to this sun-drenched southern province—an area that has inspired generations of writers, painters and musicians. Thing is, unless you want to be right beside the Mediterranean like Bill, you don't have to spend anything like $170,000 to buy a property in this southern province. I can point you toward some of its lively little towns where homes cost far less than that. The composer Giuseppe Verdi was spot on when said: "You may have the universe if I may have Italy." Even in these credit-crunched times, there's no good reason why you can't have it too. If you've been a regular reader of IL's daily e-mail Postcards and International Living magazine, you'll know we rate Italy as one of the best sunshine buys in western Europe. Which is why we put together this new edition of Escape to Italy: Everything You Need to Know to Retire Better, Invest Well, and Enjoy the Good Life For Less. What we found is this: Outside the big cities, Italy is far less costly than you probably imagine. You see, if you've visited Italy as a tourist, chances are you've spent your time in and around the cities of the north. And that you've hung around tourist bars and restaurants charging tourist prices. Relatively few foreigners ever venture south of Rome or the Amalfi Coast. "Italy's deep south is still a land of lemon groves, vineyards and ancient chestnut woods; fishing villages, wine festivals, religious parades and a wealth of traditions that are deep-rooted rather than something dreamt up by the heritage industry". If you've never explored the country's lesser-known regions, you won't have a clue how astonishingly inexpensive property (and everything else) can be. Of course, it's understandable why relatively few Americans ever travel as far south as Calabria. Or to the neighboring regions of Basilicata or Apulia. Or to Molise where the mountains meet the silvery-blue Adriatic. You see, the problem with Italy is this: there's far too much to see and savor. It's different if you live here—the potential for short breaks is incredible. But experiencing all its splendors on a few vacation trips isn't possible. Agreed, it's a sin for any visitor not to explore the watery glories of Venice… or to take in the opulence of Rome and Florence. Or to visit Umbria, the green heart of Italy, with its medieval walled towns perched like tiaras on hilltops and pilgrimages to Assisi, birthplace of St Francis. Then there's Liguria's Cinque Terre where fishing villages are slotted into the niches of towering cliffs. And it's hard to resist the charms of rural Tuscany with its classic old farmhouses, vineyards, and fields of nodding sunflowers. How can you possibly pack all this and more into a vacation? Probably the only real solution of how to fit all of Italy's magic into one lifetime is to live here full or part-time—and this is where we at International Living can help. Italy's 20 regions all have great things to offer both home-buyers—and renters too. But where, specifically, should you look? Well, in Escape to Italy: Everything You Need to Know to Retire Better, Invest Well, and Enjoy the Good Life For Less, you'll discover exactly what each region offers—and gain in-depth insights into the ones that make the most sense to us. You'll learn how much it costs to own or rent a home in all our favorite locations—old and new. Say you're looking for a village house in good condition… but you don't want to pay more than $180,000. You won't find one overlooking the Amalfi Coast at that price, but explore regions such as Apulia, Basilicata and Calabria and you'll be spoilt for choice. Italy's slower-paced south offers just as much magic as the north. Although incomes aren't as high down here, you're certainly not compromising on beauty, good food and all those things that go to make up the sweet life. High above a clear-as-crystal sea, medieval villages rush helter-skelter down hillsides. New or old, houses are strung with bright scarlet peppers drying in the sunshine; tiny jewel-green lizards scurry about everywhere. Underlying the salty tang of ozone, the air is perfumed with basil, oregano and other sweet-smelling herbs. Even the smallest towns usually bear evidence of a Byzantine, Norman, or even an ancient Greek past. No, the landscapes aren't classical Tuscan—but that doesn't make them any less Italian. Art treasures aren't as numerous, but Italy's deep south is still a land of lemon groves, vineyards and ancient chestnut woods; fishing villages, wine festivals, religious parades, and a wealth of traditions that are deep-rooted rather than something dreamt up by the heritage industry. You'll see men playing centuries-old card games and women doing embroidery… donkeys carrying firewood and shepherds tending flocks. But come to think of it, even an address in Tuscany may not be out of the question—if you steer clear of the tourist hotspots around Siena and Florence. In a village on Tuscany's wilder outer fringes, one of our contacts has a charming little stone house for $66,000. It's restored—there's no work to be done. The point is that it's usually necessary to venture beyond the fashionable destinations to find sensible prices. If you're prepared to explore… to come with me to places that have so far slipped through the foreign property-buyers' net… there are many delightful (and surprisingly affordable) homes within easy reach of the Mediterranean, the Adriatic, and unspoiled countryside. Of course, purchasing a home in Italy is not the same as purchasing in the United States. It's not complicated once you understand how things work—but if you don't know the system, mistakes can happen. Costly mistakes. It's a sad truth, but some buyers seem to leave their wits behind at Rome airport. That said, the majority of transactions go through smoothly—and yours is likely to as well. But there's no substitute for checking all the boxes and doing the right legwork to give yourself peace of mind. Armed with Escape to Italy, you'll have that peace of mind. It's senseless to contemplate living in any overseas country without knowing exactly what makes that country tick. Or how its way of doing things may affect you. So one of my main aims is to ensure that you arrive in Italy with all the knowledge you need to make an informed decision. Sure, you'll discover where to find dream views among the rolling hills and deep green valleys, or a beautiful apartment in the centro storico of a classic hilltop town. But I won't let you lose sight of reality—or of any potential pitfalls. Your magnificent view may be devalued by a tractor starting up next door at 5 a.m. every morning. The unique setting of a country home may be irrelevant if you can't get electricity to it. A step-by-step guide to the legalities, costs, and procedures associated with purchasing Italian property. Contact details for competent, trustworthy professionals to assist you in your purchase or rental. The rental market. Outside northern Italy's major cities, you'll find lots of affordable options. Take the chic resort town of Matera in Basilicata, whose old town provided the setting for Mel Gibson's movie The Passion of the Christ. You can rent a two-bedroom, 1,187-square-foot apartment for just $665 a month. How to obtain the correct visa, a residence permit, a driving license, and all the other vital bits and bobs of bureaucratic paper you'll need. Day to day living costs and utility bills—and how to get quickly connected to the electricity, water, and telephone services. Obviously utility bills will depend on property size and also the climate. Taking care of your health. Opt for local health care insurance and you'll find premiums are a lot less costly than back home. As a resident you can even join Italy's National Health Service Plan and get free treatment—we explain how. Your various options for putting your kids through school. And much more… the investment climate, negotiating the tax system, business opportunities, resources for learning the language, etc. Although most professionals speak English, this edition includes a special language primer. It will familiarize you with terms you may see and hear in the bank… on the highway… in the doctor's office… at the real estate agent's. Most phrase books neglect to cover architectural terms and real estate. But with our useful primer, you won't waste time scouring local newspaper ads for bilocali (two-room apartments) when what you really want is a casa rustica—a rural house. Lots more too. We'll even take you into the trattoria and sit you down with a host of regional menus. Others might be baffled when faced with a dish called i radiatori, but you won't. You'll already know it's ruffled and ridged pasta. You may want to avoid asinello, though. There's nothing like trying local specialties—but I've yet to meet any expat with an appetite for Sicilian donkey steak! Although Escape to Italy primarily focuses on the practicalities of relocating and real estate, Italy offers some fabulous vacation experiences. Whether you choose to spend your time absorbing the atmosphere of one of the great art cities, exploring rural medieval towns, or basking on a beach, you're in for a wonderful treat. So you'll also find a section devoted to Traveler's Italy. In this, there are lots of recommendations for hotels, agriturismos and workshop experiences. Oh, and a festival sampler too. If I say the word 'palio' you'll probably think horses. Well, yes—the Palio in Siena is a madcap horserace. But there's also the Palio del Papero at San Miniato, Tuscany. This is a duck festival—but a festival to do with the racing of ducks, not the eating of them. Sounds crazy, but the ducks represent the four neighborhoods of the town and the festival (which includes a historical pageant and plenty of opportunity for gorging on non duck-related food specialties) apparently goes back to medieval times. Siena has its horses… San Miniato has its ducks. And we've explored numerous locations beside Italy's famous—and not-so-famous—rural regions and seaside hideaways. In Escape to Italy: Everything You Need to Know to Retire Better, Invest Well, and Enjoy the Good Life For Less, you'll find comprehensive details about city life too… about what it's like to live in Venice, Florence, and the country's fashion and business hub, Milan. Plus there's an entire in-depth section on Rome, the Eternal City. Doesn't it send shivers down your spine simply to imagine being in Italy's capital? To visit the Coliseum where baying mobs urged on gladiators? Or the Forum whose very stones are the same that the Caesars walked among? The Vatican… the Trevi Fountain… the Arch of Titus… the Castle of St. Angelo… the Aurelian walls. With more than 2,600 years of history and culture, the whole of the city has been likened to a museum—albeit a museum with elegant shopping areas, green parks, and arguably Italy's most vibrant lifestyle. Not surprisingly, Rome has long been a magnet to North Americans. With several thousand expats living in and around the city, you won't find it difficult to meet fellow residents—and a number of American contact groups are based here. Rome is irresistible, but it's a world-class city—and quality homes are expensive. I don't pretend otherwise. Or consider buying a home near Rome rather than in the capital itself. For example, there's a small medieval town in Lazio region that's only 25 miles north of Italy's capital. It boasts a 12th-century hospital, a castle, and several churches dating from the Medieval and Baroque eras. The picturesque center, complete with cobbled square and grand stone town gates, is often used in movies. A totally restored apartment in its historic center, with a living room, kitchen, bathroom, and one bedroom is €60,000 ($64,500). It's not one-off. Our Lazio contacts have other appealing options too. Another piece of news for those with an eye for potential easy profits. As with low-cost airlines, train links—particularly high speed trains—have a dynamic effect on property prices. Trenitalia is currently investing around €2.5 billion on cleaning up and renovating stations in three major cities—and a number of high speed train routes are being introduced. When better transport comes into play, higher house prices tend to follow, often by as much as 40% in two or three years. But I don't have enough space to tell you everything that I'd like to. If you share my own passion for Italy, I urge you to get hold of Escape to Italy. $99 is a tiny price to pay for the wealth of information it contains—information you just can't get anywhere else. It would take a lifetime to see and experience all Italy has to offer. But I assure you—whatever attracts you to Italy—the food, the scenery, the affordable real estate or the sensuous, self indulgent lifestyle—you'll find all the information you need inside Escape to Italy. Special Bonus Report: La Dolce Vita - 8 Places in Italy to Find a Home for Less Than $150,000 (And Sometimes a Lot Less). You'll learn exactly where to find these homes. Yes, even in glamorous Tuscany. If this report were to go on sale on IL's Bookstore, I'm told we'd charge $29.95 for it. So effectively, you're getting the new Escape to Italy at a ridiculously low price. I want to assure you again that this wonderful, ravishing corner of the earth certainly isn't unaffordable. Even on a shoestring budget, you don't have to give up your dream of living or retiring here—or of owning a vacation property. And the best part is that we publish Escape to Italy electronically… so it's much more useful, colorful, and interactive than ever before. Plus, you'll have access to it as soon as your order has processed. Try it out… even take it to Italy in search of your dream home or investment. We're so confident you'll realize your dreams in Italy that we'd like to offer you International Living's 30-day money back guarantee. If at any time you decide that Italy isn't for you, simply let us know within 30 days and we'll refund you the full price… no questions asked. Try it today. Explore all Italy has to offer. And if after exploring her delights you decide that Italy is not the place for you, you have our 30-day money back guarantee—no questions asked. Please note, this format is a downloadable PDF. If you would like to purchase a printed version, go here. P.S. Order Escape to Italy: Everything You Need to Know to Retire Better, Invest Well, and Enjoy the Good Life For Less, and we'll also send you the special bonus report, La Dolce Vita - 8 Places in Italy to Find a Home for Less Than $150,000 (And Sometimes a Lot Less), all for just $99.